Trace de Trail offers you, according to your subscription, several methods to calculate the distance and the elevation gains of your track. The starting point : a quality track ! For an accurate estimate of the distance and elevation gains, it is important to create a quality track with a good density of points. 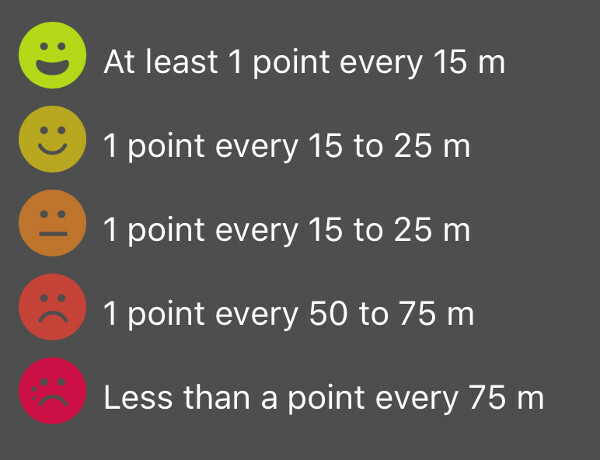 For each track, you have the average distance between two points with a smiley as an indicator ! If your track is from a gpx file with elevations, you can use them to calculate the distance and elevation gains of your track. Using a gpx file that you obtained with your watch, your GPS or your smartphone is not a guarantee of quality. The GPS signal can be degraded in the valleys, but also in the city between two buildings ! If the use of the elevations of your gpx generates a very irregular profile with a succession of peaks which do not correspond to the reality, use rather the elevations of a DEM ! On Trace de Trail you have several DEM to get the points elevations of your track. In order to define the points for which an altitude will be requested, Trace de Trail will densify or lighten your track to obtain a homogeneous distribution of points. For this, a resampling parameter is used. Its default value is 30 m : it is this value that gives the best results. A threshold is also used to calculate the elevation gains with a default value of 3 m.
When creating a trace in rapid mode, the ASTER DEM method with a threshold of 3 m is used. Nevertheless, if you have imported a gpx with elevations, these are kept and the calculation method can be modified in a second time.